"Murder is an insidious thing. Once a man has dipped his fingers in blood, sooner or later he'll feel the urge to kill again." Sherlock and Dr. Watson head to Scotland to investigate the murders of the members of a club, where the surviving members inherit the insurance policy of the deceased. When a member is delivered a message containing orange pips, he does not have much time left on earth. As Sherlock investigates the murders continue. Poison needles, poisoned drinks, envelopes with pips delivered to members, a body with no arms, legs or heads. The envelope is delivered under the door while all the members are at the table. Everyone comes to dread the housekeeper walking in to the dining room to deliver a note. Finally there are only two members left of the Good Comrades Club. Dr. Watson investigates some crashing noises. He shoots out windows, a man in in armor and almost shoots a cat, all the while talking to himself. 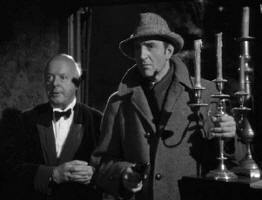 Later, while digging a grave of one of the murdered members Watson has a conversation with an owl who keeps saying Who? Watson keeps answering him, thinking he is talking to Holmes. Meanwhile the coffin is empty. After one more murder, there is only one club member left. Alastair must be the murderer and Lestrade arrests him. However as they investigate they discover that all the club members are alive. Alastair was to be the dupe. The six members were convicted and Lestrade was given credit. The insurance company was happy with the work Holmes had done for them. Overall this entry in the series, was just OK.